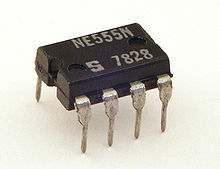 IC555 is designed as an Astable multivibrator as usual. But the control voltage pin is used to connect a Piezo element instead of the disc capacitor. The intention is that, the Piezo element generates a minute voltage when it is mechanically stressed. Output pin is connected to a 30 cm plastic wire antenna for transmitting the signals. Just tap on the Piezo element. You can hear the tapping sound in an FM radio tuned exactly. Slowly turn the tuning knob of the FM radio along with tapping on the Piezo element. At a particular point, the tapping sound will be heard in the radio. 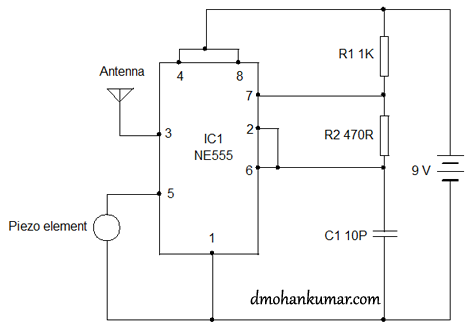 I have seen one similar circuit using MIC for transmitting voice in AM Band. I can give an idea. Glue the piezo element on the door and make a remote Door knock transmitter. But the range is poor. It will be around 1 Meter.